If you love curry, this is another curry dish, curry fried rice. It is easy, simple and anyone can just whip up without any problem. I prefer not to use overnight leftover rice for my fried rice dish, as I always feel that is not that healthy. I would rather cook the rice early in the morning or many hours before hands. 2. Heat oil in a wok or frying pan, fry the curry leaves for half a minute. Stir in the curry paste and fry until fragrant over medium heat. 3. Stir in the cooked rice, mixed vegetables and season with salt. If it is too dry, sprinkle some water on it. Fry about 2-3 minutes or until rice is heated through. Serve hot. 2. Oil for frying the curry paste should be heated to the right temperature and maintained at a steady heat until the curry spices have release their flavour, without burning. Dried wonton noodle tossed with a simple homemade sauce. Top with some blanched vegetables and crispy fried wonton or Wonton in Soup and serve with a small bowl of wonton soup and pickled green chilli. 1. Place the Chinese flowering mustard in a pot or wok of boiling water and blanched for 1 minute. Set aside. 2. Loosen and rub the noodle lightly with your hand to remove any excess flour coating. 3. Place the noodle (one at a time) in the boiling water and cook for 1-2 minutes. Drain the noodle thoroughly and place in a serving bowl. Add oil, salt, vegetarian oyster sauce, dark and light soy sauce. Toss well to mix. 4. Transfer to individual serving dish, top with Chinese flowering mustard, crispy fried wontons. 1. Only olive oil can be consumed as it is. To make ginger oil or garlic oil, heat the ginger slice or chopped garlic in vegetable oil until light brown. 2. Alternatively, cook the noodle following the packet instructions. Discard the water for cooking noodle if it turned “cloudy and starchy”, it will affect the texture of the cooked noodles. Oatmeal Butter Prawn is a popular dish in the restaurants in Singapore. And Pasta is a popular dish in the West. By matching and mixing them together, an “East Meet West” Dish is derived. Just cook the pasta, toss it with salt and olive oil. Add the Oatmeal “Butter Prawn” on top of it ( refer to the recipe Vegan Oatmeal Butter Prawn). 1. Cook pasta or angel hair according to packet instructions and set aside. 2. Heat the oil in a wok or frying pan. Stir fry the ginger or garlic until fragrant. Add the cooked pasta. Season with water, salt, pepper and toss evenly. 3. Transfer to individual serving dish and top with the vegetarian pawns. Serve immediately. This vegetarian version of Chinese Soon Kueh consists of simple ingredients such as yam bean, carrot and water chestnut, without any shrimp. The vegetable julienne cannot be too thick or thick, as it will affect the chewing process. To make soon kueh skin or wrapper, use soon kueh premixed flour (Soon Kuay Flour – SunFlower Band) from the supermarket and follow according to the packet instruction. 1. Heat oil in a wok. Add the garlic or ginger and fry till fragrant. Add in all the vegetables and stir-fry briskly. Add the water, salt, sugar, light soy sauce and pepper. Stir fry over high heat for 1 minute, stirring occasionally and simmer until the vegetables is tender. 2. Transfer to a dish and let it cool. 1. Place a piece of flatten soon kueh thin sheet in front of you. Place some of filling in the middle and fold up to form a semi-circle. Pinch to seal. Arrange on a well-greased streaming. 1. Steam for 15 minutes or until the soon kueh is translucent. Remove from the streamer and dizzle with garlic oil or olive oil. Cool slightly before serving with chilli sauce. Oatmeal Butter Prawn is a popular dish in the restaurants in Singapore. By replacing butter with non-dairy margarine, prawn with mock prawn (made of beancurd skin, carrot and radish strips and mushroom), omitting the milk powder and egg, the vegan version is derived. If you find that deep-frying the mock prawns is not ultra-healthy, just brush some oil and bake it instead. 1. Heat the oil in a wok over high heat. Place the vegetarian prawns into the hot oil and fry until lightly golden brown. Remove the vegetarian prawns with a slotted spoon. Drain well on kitchen paper and set aside. Alternatively, bush some oil on the vegetarian prawns and bake for a healthy choice. 2. Mix the oatmeal, salt, sugar and pepper in a bowl. Set aside. 3. Heat the margarine in a wok or frying pan over medium heat. Stir fry the curry leaves and chilli for 1 minute. Add in the oatmeal and stir fry until all the ingredients are crispy and aromatic. 4. Add in the vegetarian pawns and stir fry briskly. Dish up and serve hot. This is an easy home-made sweet soup. Besides, steaming sweet potatoes as a healthy snack, it can be used to boil to make a simple and delicious dessert. It is very nutritious, rich in dietary fiber as well as good source of vitamin A, C and B6. 1. Place all the ingredients except sugar in a pot. Bring to a boil and simmer for 15-20 minutes or until the sweet potatoes are tender. Add in the sugar and bring to a boil again. 2. Ladle the dessert into individual serving bowls and serve. A quick cream corn soup with potato and cardoncello mushroom added. 1. Place all the potato and mushroom and water in a pot. Bring soup to a boil and simmer for 10 minutes or until all the vegetables are tender. 2. Stir in the sweet corn, corn flour mixture and bring to a boil. Season to taste with salt and pepper and light soy sauce. 3. Ladle the soup into individual serving bowls and serve. A quick and easy to cook cabbage dish with creamy sauce, using soy milk instead of milk, which is suitable for Vegan. 1. Heat oil in a wok. Add the ginger and fry till golden brown. 2. Add the cabbage, mushrooms and stir-fry briskly for a moment. Stir in the soy milk, season to taste with salt, black pepper and sugar. Simmer until the sauce is slightly dry or the vegetables are tender. 1. If the sauce is too much watery, mix ½ teaspoon of corn starch with 1 tablespoon of water and stir in. 2. Vegetarian ham can be added, if desired. Another quick and simple delicious tofu dish, yet it contains simple ingredients and is easy to get. Fresh shiitake mushroom or cardoncello mushroom or shimeiji mushroom can be used or added to this dish, if desired. 2. Heat oil in a wok. Add the ginger and fry till golden brown. Add the mushroom stir-fry for less than a minute. Add in the tofu and stir-fry briskly. Stir in the sauce mixture, spring onion or coriander leaves, chilli and simmer until the sauce is thickened. 3. Transfer to a serving dish and serve with rice. 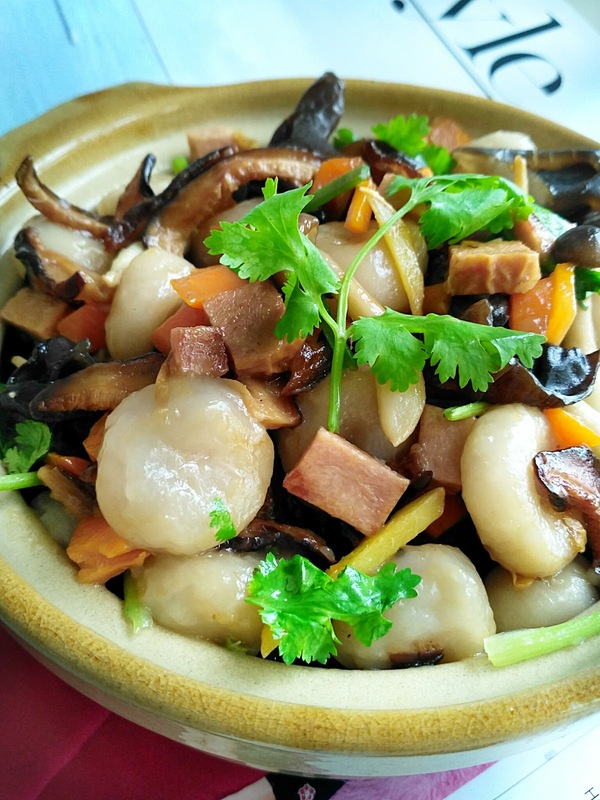 This vegetarian version of Chinese dumpling consists of vegetarian ham or vegetarian meat and chopped vegetables like Chinese cabbage, carrot, mushroom and water chestnut. It can be boiled or steamed or cooked in steamboat. A popular dish during Chinese New Year. 2. Heat oil in a wok. Add the garlic or ginger and fry till golden brown. Add in all the vegetables and stir-fry until tender. Stir in the sauce mixture and fry until dry. 3. Transfer to a dish and let it cool. 1. Lay a dumpling wrapper in front of you. Place some of filling in the middle and wet the edge with some water (or water and flour mixture). Fold up. Work from right to left, press and shape the dumpling. Press and seal the dumpling’s opening with your thumb. 1. Bring 750ml of water to a boil in a pot or wok. Add the dumplings and return to the boil. Remove the dumplings with a slotted spoon when they float to the surface. 2. Transfer to individual serving bowls and garnish with one or two Chinese lettuce leaves. Ladle the hot soup into the bowl and sprinkle with some fresh spring onion. Vegetarian Fish Curry is simple vegetable curry with vegetarian fish added which can be optional. It is spicy and taste a bit sour and either served as a side dish or with rice as a light lunch. 1. Grind shallot, garlic, vegetarian belacan, candlenuts into fine spice paste and set aside. 2. Mix the curry powder and chilli powder with a tad of water to form curry paste and set aside. 3. Heat oil in a pot or wok, fry the spice paste until fragrant. Add in the curry paste and fry over medium heat until fragrant. 4. Add in the water, lemon grass, curry leaves and egg plant. Bring to a boil and simmer for 5-10 minutes until the eggplants are slightly tender. Add in tomatoes, chilli, beancurd puff, lady’s finger and simmer for 3-5 minutes. Stir in coconut milk and assam juice. Season with salt, sugar and bring to a boil. 5. Lastly, add in the vegetarian fish slices and serve immediately with rice. This is a quick and easy to cook watercress stir-fried dish using inexpensive ingredients. Watercress is a super food that contains significant amounts of iron, calcium, folic acid, vitamins A and C.
2. Add the watercress and stir-fry briskly for a moment. Season to taste with vegetarian oyster sauce. This is a simple and inexpensive dish. The cooking style is simple, quick, and easy to whip up within few minutes. 2. Heat oil in a wok or frying pan. Add the ginger and fry until golden brown. 3. Add the tomatoes and stir-fry for 1 minute. Add the tofu and stir-fry briskly for a moment. Stir in the sauce, continue to cook. Stirring constantly for 2-3 minutes until the sauce has thickened. 4. Garnish with coriander leaves or spring onion, transfer to a serving dish, and serve immediately. This is a simple and easy kueh’s recipe, for the sweet tooth. You can choose to shape it like ball, flatten or make into a triangle shape. 1. Wash the glutinous rice and place in a bowl with enough water to cover. Leave to soak for 3 hours or more. Drain thoroughly. 2. Place the glutinous rice, water, salt and pandan leaves into an electric rice cooker, mix well and turn it on. 3. When done, use your hand to shape the rice into 8 balls. Coat them evenly with the fresh grated coconut. Set aside. 4. Combine chopped gula melaka with water in a small pot and cook over medium heat until sugar dissolves. Strain into a serving jug and set aside. 5. Serve glutinous rice ball with gula melaka sauce. By deep-frying the fresh shiitake mushroom cubes coated with tapioca flour, it tastes almost like the real lard crisp and can be added to any dishes or noodles. 1. Place the mushrooms in a bowl. Add the tapioca flour, salt, pepper and mixed well. 2. Heat oil in a wok over high heat or until a cube of bread dropped into the oil brown in few seconds. Place the mushrooms into the hot oil and fry in batches until lightly golden brown. 3. Remove the mushrooms with a slotted spoon. Drain well on kitchen paper and set aside. Deep-fried fresh shiitake mushrooms coated with tapioca flour can be a tasty snack by itself. This mock eel recipe makes use of the dangly strips of shiitake mushrooms which is deep-fried and then stir-fry in a sweet–sour ginger sauce. This dish can be served as an appetizer. 4. Heat oil in a wok. Add the ginger and fry till golden brown. 5. Add the deep fried mushrooms and stir in the sauce mixture. Stirring occasionally until the sauce is slightly dry. 6. Sprinkle sesame seeds, transfer to a serving dish and serve. This is a simple and inexpensive, fairly quick and easy to prepare dish, but looks and tastes very impressive. Serve with pickled green chilli. 1. Blanch the mangetouts in a pot of boiling water for 1-2 minutes. Drain well and set aside. 2. Heat oil in a wok or frying pan. Add the ginger and fry till golden brown. 3. Add the carrot, mushrooms and stir-fry briskly for a moment. Add the water, vegetarian oyster sauce and yee mee, continue to cook, stirring constantly for 2-3 minutes until the sauce has thickened and the yee mee is tender. 4. Add the mangetouts, sesame oil and toss to mix. Transfer to a serving dish and serve immediately. This is an easy-to-prepare healthy clear vegetable soup, which is real yummy. 1. Place all the ingredients and water in a pot. Bring soup to a boil and simmer for 20 minutes or until all the vegetables are tender. Season to taste with salt, pepper and light soy sauce. 1. Vegetarian mock meat can be added, if desired. This quick and easy steamed dish is using eggplant, aubergine or brinjal. Choose eggplant with smooth and unblemished skin. Normally, eggplants are not peeled as the skin preserves their texture, taste and shape. 1. Arrange the eggplant in a heat proof serving plate and steam for 10 minutes or until soft. 2. Garnish steamed eggplant with coriander. 3. Heat the oil in a wok and add ginger, chilli and stir-fry briskly until aromatic. Drizzle over the steamed eggplant. 4. Add light soy sauce before serving. 1. Peel the skin of eggplant, if desired. This recipe is easy to make, it can be prepared well in advance and when you are ready to eat all you have to do is heat up and add the seasoning. 1. Place the eggplants in a pot or wok of boiling water and cook for 10 minutes. Turn off the heat and leave eggplant to cool in the cooking water. 2. When it is cool enough to handle, remove and cut each eggplant lengthwise in halves. With a spoon, scoop the flesh out of the skins and put in a serving plate. 3. Mash the scooped-out eggplant flesh well and garnish with coriander leaves. 4. Heat the oil in a wok and add ginger, chilli and stir-fry briskly until aromatic. Drizzle over the eggplant. Season to taste with light soy sauce before serving. This is another Hakka cuisine – Yam with Belly Pork or Sandwich Yam and Pork. In this quick and easy vegetarian version, only yam is used and dried mushrooms are added. To substitute for the pork, uses deep fried firm tofu or beancurd slice, if desired. 2. Add the red fermented bean curb, Chinese five-spice powder, cooking wine and stir-fry briskly until aromatic. 3. Add the mushrooms, taros, sesame oil and water. Bring to a boil and simmer for 10-15 minutes or until the sauce is slightly dry. 4. Transfer to a serving dish and garnish with coriander leaves. 1. Taro can be deep-fried prior to be stewed, if desired. Popiah or fresh spring rolls are a popular street food, which is filled with stewed julienned yam bean, beansprouts etc and wrapped in a paper-thin crepe. 1. Blend the chill in a blender or food processor until it is a smooth paste. Season to taste with salt and sugar. 1. Heat oil in a wok. Add the ginger or garlic or shallot and fry till golden brown. 2. Add the salted soy bean paste and stir-fry briskly until aromatic. 3. Add the yam bean, mushrooms, carrot and stir-fry for 1 minute. Stir in water, sugar, salt, light soy sauce, vegetarian oyster. Stir occasionally and simmer for 10-15 minutes or until the vegetables are tender and sauce is slightly dry. Season with sesame oil and pepper. Set aside and keep warm. 1. Place 2 fresh Popiah wrappers overlapping each other on chopping board. Spread sweet sauce and chilli sauce on it. 2. Place a small Chinese lettuce leaf in the centre and top with yam bean filling, beansprouts, grounded peanut, vegan ‘egg’ and coriander sprig. 3. Roll up and cut into 4 or 5 pieces and serve. 1. How to make Vegan Scrambled Egg. 2. A pinch of chinese five-spice powder can be added, if desired. Vegetarian Oyster Sauce and Light Soy Sauce can be optional. Old ginger and sesame oil are some of the commonly used ingredients in Chinese Traditional Confinement Recipes. It is believes that ginger would help to expel the wind and sesame oil promote blood circulation. Here is another way to consume ginger by frying shredded ginger with sesame oil, removing any excess oil by draining and use it as a condiment to any rice or dishes. 1. Heat sesame oil in a wok over medium heat and fry ginger until lightly brown. 2. Remove the ginger with a slotted spoon. Drain well on kitchen paper. 3. Store the crispy ginger in a glass jar in a cool place. Pig Trotter with old ginger and black rice vinegar is one of the traditional Chinese confinement foods. For this vegan version, pig trotter is replaced by gluten fungus roll and eggs are omitted. 1. Brush some sesame oil on the ginger and bake in the oven or oven toaster for 10 minutes. Set aside. 2. Place all the ingredients in a claypot, bring to a boil and simmer for 45 minutes. Season to taste with salt. 3. Ladle into individual serving bowl and serve. 1. This traditional recipe usually fries the ginger in sesame oil instead of baking. The sesame oil used is around 3 instead of 1 tablespoon. An easy dish to prepare and makes a satisfying light meal. Just combine all the ingredients in a pot. By leaving out the stir-frying of the ingredients, it speeds up the cooking process and also reduces the amount of oil used. Photographer: Little JF This is an easy steamed dish without much work at all. This dish can be used as a substitute for the poached chicken that goes with Hainanese Chicken Rice. Alternatively, just wrap a piece of lettuce leaf around a slice of cardoncello mushroom and dip with chicken rice chilli, to eat. 1. Arrange the ginger and cardoncello mushrooms in a heatproof serving plate. Drizzle sesame oil and light soy sauce over the plate. Steam for 10 minutes. 2. Garnish with coriander and serve immediately. Egg Fried Rice is a common dish in Chinese Restaurants in the West. This is a vegan version, substituted the egg with firm tofu/beancurd which easily resembles the scrambled egg used in the fried rice. The turmeric powder is added to derive the colour of the egg. 1. Marinate the scrambled tofu with turmeric powder, salt and sesame oil. Set aside for 10-15 minutes. 2. Heat oil in a wok over medium heat and fry scrambled tofu until lightly brown. 3. Stir in the cooked rice and season with salt and pepper. Fry about 2-3 minutes or until rice is heated through. 4. Add in the spring onion, mix well and serve hot. This is a quick and simple one-pot vegetarian rice dish recipe. Not much work is required and can be ready in just a moment. 1. Carrot can be used to replace vegetarian meat, if desired. 2. Curry powder and chilli powder can be mixed with a tad of water to form curry paste, fry with one of tablespoon oil and then added to the rice. This is a easily made party dessert. 1. Combine pandan leaves, sugar and bring 1.5 litres water to a boil. Stir in sago pearls and simmer for 5-6 minutes or until sago pearls are almost translucent with just a barest white fleck in the centre. 2. Pour the content of the pot a fine-meshed sieve and drain off excess water. Immediately, spoon sago pearls into the moulds or cups, pressing lightly to pack them in. Let it cool, and chill for 1 hour or until fully set. 3. Combine chopped gula melaka with water in a small pot and cook over medium heat until sugar dissolves. Strain into a serving jug and set aside. 4. In a clean pot, bring coconut milk with salt to a boil. Alternatively, sprinkle salt to coconut milk. Chill and set aside. 5. Serve sago pudding with gula melaka sauce and coconut sauce. 1. Add different food colouring to sago pudding, if desired. This delicious soup (Tom Yum) is one of the popular soups in Asia. Combining spicy and sour using mixture of herbs and seasonings is easy to make. The richness of the sour taste comes from the complement of the different citrus flavored ingredients. 2. Place the lemon grass, dried kelps, ginger and water in a pot. Bring to a boil and simmer for 10 minutes. Remove the lemon grass and ginger with a slotted spoon and discard. Add straw mushrooms, vegetarian fishballs, lime leaves, chillies, pepper, sugar, lime juice and simmer for 3 minutes. Lastly, stir in light soy sauce and coriander leaves. 1. Commercial tom yum paste, button mushroom, tomatoes, silken tofu can be added, if desired. This recipe is inspired from “Ma Po” Tofu but with a slight variant. Enokitake is also known as golden needle mushroom. 2. Heat oil in a wok. Add the garlic or ginger and fry till golden brown. Add the mushroom, tofu and stir-fry briskly. Stir in the sauce mixture, spring onion or coriander leaves, chilli and simmer until the sauce is thickened. The Hakka Yam Abacus Beads used to be a festive dish in Singapore among the Hakkas. The main ingredients are taro or yam and tapioca flour, mixing together to form a dough and make into little abacus beads to signify wealth. Method1. Arrange the yam in a heatproof serving plate and steam for 10-15 minutes or until soft. 2. Mash the yam in a container with a fork. Add the tapioca flour, salt, sugar and mix well to form dough. Knead until the dough is non-sticky. Divide the dough into 40 small pieces and roll each into a ball. Shape them into abacus beads by using the thumb and finger to make a slight indentation in the centre of each ball. 3. Bring 750ml of water to a boil in a pot or wok. Add the yam balls and return to the boil. Remove the yam balls with a slotted spoon when they float to the surface. Transfer to a bowl of cold water or coat with 2 tablespoons of oil to prevent sticking. Set aside. 5. Add the carrot, mushrooms, black fungus and stir-fry briskly until aromatic. Season with salt, pepper, sesame oil and light soy sauce. 6. Add the yam balls and stir fry for 1-2 minutes. Transfer to a serving dish and garnish with coriander leaves. 2. Heat oil in a wok or frying pan, add the curry leaves and fry for half a minute. Stir in curry paste, fry until thickened and fragrant. 3. Stir in the potatoes, carrot, onion, water, coconut milk and simmer for 15-20 minutes or until the potatoes are tender. Add salt and sugar and cook till the gravy is slightly thickened. Set aside. 4. Lay a wonton wrapper in front of you. Place a bit of filling in the middle. Fold up the wonton diagonally, making sure the end meet. Press down firmly on the ends to seal. 5. Heat wok with oil. Add wanton few at a time, sliding them in carefully and turning to make sure they are golden brown evenly. 6. Drain on paper towels and served as soon as possible to ensure they remain crispy. A quick and easy to prepare snack which are enjoyed by many at home and at the Night Market Street Stalls (Pasa Malam). 1. Heat oil over a high fire and deep fry the beancurds until golden brown. Remove, drain on kitchen paper and leave to cool. 2. Blanch the bean spouts in boiling water for 1 minute and drain well. 3. Stuff the beancurds with a slice of cucumber and some bean spouts. Serves with chilli sauce.